The agriculture industry is said by many experts to be the industry that will be most affected by commercial drones at least in the next 10 - 15 years. Agriculture drones are going to lead the revolution of commercial drones. They will be the first industry which will be affected enough to turn heads and make other industries follow in pursuit. They may not end up being the most impacted industry, but they definitely will be for the next decade or so. According to the Association for Unmanned Vehicle Systems International (AUVSI) nearly 90% of the UAV/drone economic impact 2015 will be agriculture related, that’s 90% of nearly $2 Billion USD . 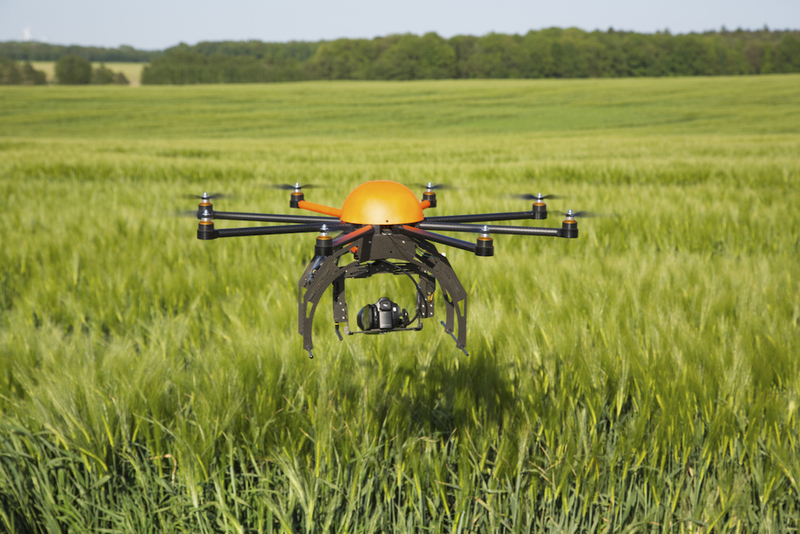 Although in previous years the agriculture industry has not had as big of an impact, in 2015 the overall impact of drones will greatly increase, led by a massive increase in the impact on the agriculture industry. Drones for every industry are different, each drone type will have different capabilities for its needs although some may be the same across industries. For the Agriculture industry, there are a few different types of drones but the main increases in efficiency and cutting costs come from the data that the drones capture. One of the applications in the agriculture industry of drones is to use data gathered from drones to determine what crop rotation cycle is the best (these types of drones can be seen on the right). From there on you can use the rotation cycle suggested by the drone data to increase output from the same area of farmland. This in turn increases revenue. Today farmers spray pesticides on their crops to make sure they don’t have diseases. With data supplied by drones, farmers will be able to find out exactly where the disease is and how much area around it should be sprayed with pesticide to stop the spread. This means that not all the crops would have to be sprayed with pesticides. This would massively decrease the operating costs by decreasing the amount of pesticides that needs to be bought. This drone data will also allow farmers to calculate hydration and growth rates across the farm. If these three applications are put into use across the Agricultural industry, they would massively decrease operating costs and increase output. This would mean that smaller farms can compete with bigger ones because of their increases in efficiency, output and decreased operating costs. By allowing smaller farms to be equally competitive, the agriculture industry as a whole would be able to progress towards being a more competitive market, lowering prices of crops for consumers and disbanding monopolies on certain kinds of crops. There is also another type of agricultural drone which is still underdeveloped and will not be an application in the coming years but may be soon after that. This drone is very specific to the agriculture industry. It replaces crop duster aircrafts. It (can be seen on right) works by spraying the crops with pesticides instead of doing it using a crop duster. They are more precise in spraying pesticides and, therefore, require less amounts of it and they also are unmanned therefore they cut labour costs. Although they would be expensive, they will be generally cheaper than their alternative, crop duster aircrafts. This would reduce the capital needed for a big farm and also cut labour costs. However, it is important to remember that this is more of an experimental technology and will not be able to affect the agriculture industry in the coming years. "Economic Report." Auvsi.org. Association for Unmanned Vehicle Systems International, n.d. Web. 27 July 2015. <http://www.auvsi.org/econreport>.